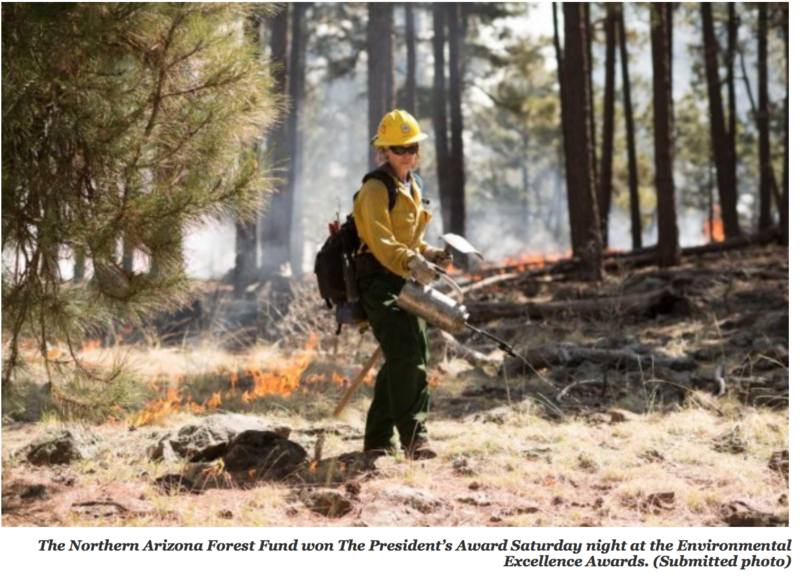 The Northern Arizona Forest Fund took the top honor Saturday night in the Environmental Excellence Awards presented by SRP at the Westin Kierland Resort. Judges also named the Arizona Pure Water Brew Challenge as winner of the Governor’s Award for Arizona’s Future, and two new categories – Sustainability Champion and Waste Reduction – made their debuts. Northern Arizona national forests provide the majority of water to the Salt and Verde rivers and eventually into the homes of millions of Phoenix-area residents. The Arizona Pure Water Brew Challenge overturned a long-standing legal prohibition against potable water reuse. It also used craft beer to educate the public about the benefits of the “toilet to tap” revolution, the release stated. The team took to festivals, conferences, parades and expos to get their message out, which resulted in changing a law. 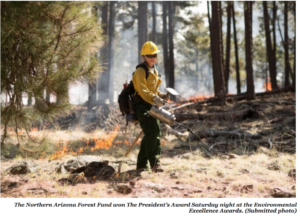 Arizona Forward celebrated the 38th anniversary of its signature awards program, drawing more than 500 social influencers and innovators representing public and private sector interests. Local First Arizona founder Kimber Lanning saved a bungalow that was slated for demolition and gave it new life as the Local First Arizona headquarters. The process took more than three years to complete. Today, more than 30,000 people see the restored bungalow during monthly First Friday events. The Ocotillo Restaurant features desert-adaptive materials and water-harvesting elements that blend into the Southwest. Desert palo brea and mesquite trees provide shade, while the restaurant’s namesake ocotillo plants are featured at key locations. A sunken lawn provides a gathering place and harvests water. The Northern Arizona Pollinator Habitat Initiative promotes the creation, protection and registration of pollinator habitat across Northern Arizona, while highlighting the important role pollinators fulfill in the global food supply. The effort increased local pollinator garden registration tenfold in its first year. Spaces of Opportunity addresses community connections, food deserts and social justice and allows residents to learn about science, technology, engineering and agriculture. The incubator farm encompasses 3,000 square feet; kale, mustard greens and beets have sprouted this year. The Mesa Rio Salado-Stadium Connector Pathway filled a 3.5-mile gap in the Valley’s network of shared-use paths along the Salt River, Crosscut Canal and adjacent neighborhoods. Community partners include the Chicago Cubs, Oakland A’s, Riverview Development, SRP, Arizona Department of Transportation, Flood Control District of Maricopa County, United States Army Corps of Engineers, Salt River Pima-Maricopa Indian Community and the cities of Mesa and Tempe. The South Mountain Park and Preserve Plan will help the desert mountain preserve address the challenges of increasing popularity so future generations can connect with the desert. The plan identifies 51 miles of existing designated trails to be protected or improved and adopts 38 miles of existing non-designated trails into the designated trail system. U-Haul designated a portion of customer contributions in 2017-18 to the National Forest Foundation to support its Prescott Aspen Restoration Project in the Prescott National Forest. One-hundred-fifty acres across two aspen stands were restored, protecting a watershed. The city of Peoria’s new Patrol Services Building provides an immediate return on investment through ongoing water and energy reduction while providing a comfortable work environment for Peoria’s officers and staff. The building’s energy costs will be 41 percent less than a typical building, and it is tracking LEED Gold certification. Part regenerative landscape and part outdoor classroom, the Glendale Desert Food Forest connects residents to the Sonoran Desert’s array of water-wise edible plants. It includes more than 100 edible plants and involves partners such as the Glendale Public Library, Linking Edible Arizona Forests Network, Maricopa County Master Gardener program and Trees Matter. Phoenix Mayor Greg Stanton worked to establish Phoenix as an oasis of pragmatic, economically beneficial environmentalism. He asked Phoenix voters to approve a tax increase to benefit mass transit while running for his own re-election, while also converting 100,000 Phoenix streetlights to efficient LED bulbs. Mr. Stanton was also instrumental in developing public-private circular economy partnership through ASU to raise landfill diversion to 30 percent. Submitted by: McCarthy Building Companies, Inc. Submitted by: Dig Studio, Inc. Submitted by: Energy Systems Design, Inc.